When I am not busy making the business world safe for storytellers everywhere(dramatice pause as I am flipping my cape back and staring deep off into the horizon), I still am the director of Storyteller.net. In one of our latest fun things, we take a look at storytelling card game for families and kids. Review here. Video below. New Book! "Measures of Story"
I've released a new book! For the next few days, you can get the book (Ebook or Kindle), a free teleseminar and the audio version of the book for just $6.97. Yes, that's just about giving it away. To get the teleseminar and the audio book, please order by the 11th. Details on the site. I have a free chapter to read, a free chapter to hear, the table of contents to download all on the new website for the book. No registration is required for the free reads or audio. *Explore the differences between stories, anecdotes and floats. *Replace your archaic “elevator speech.” Understand why real stories make better communication tools. *Learn the most overused floats that aren't the stories you might think they are. *See how these anecdotes and floats become stories with examples for the personal and business world. 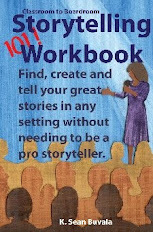 *Create your new stories with Sean’s “Take Action!” activities.